My friend Duke told me about this. I thought he was pulling my leg, but here it is, My Yiddishe Momme Cha-Cha. I’m finding nothing online about it. 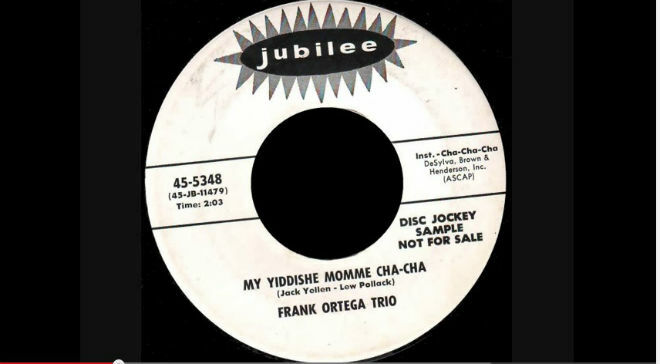 Anyone who knows music better than I do, please let me know what’s particularly “yiddish” about this cha-cha. Are they Hebrew or Arabic scales? An homage to his producers? Be that as it may, I like it a lot. It’s slinky. You can hear it here. This entry was posted in uncategorized and tagged American Judaism, music. Bookmark the permalink.